A pilgrimage to Mt. 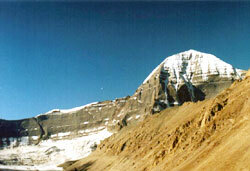 Kailash, the sacred mountain of Tibet is sacred to both Hindus and Buddhists. 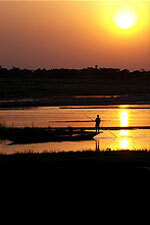 Mt Kaliash is the source of four great asian rivers. For Hindus it is the throne of Shiva, for Buddhists, a gigantic natural Mandala. Also the epicenter of Tantric forces for both religions. This trek takes you from the far western town of Simikot, along an old trade route into Tibet. An arid, wild, country dominated by the peaks of Api and Saipal Himal, this is the world of the Nepalese and Tibetan traders. You will encounter travelers with horses and yaks laden with goods. After a few days trek on the Nepal side we take you to Tibetan border market Purang where Nepalese, Tibetan and Indian traders meet to exchange wares. The highlight of the trip is to visit Rakshastal (Devil Lake), the holy Lake of Mansarovar, "born from the mind of Bramha", trek around the Mt. 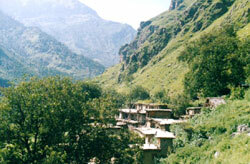 Kailash and visit the former Gu-ge kingdom with its two main centres of Toling and Tsaparang. porters/mules for the trek up to the Tibetan Boarder. O/N camp in the tent. Day 03 Trek to Dharapani O/N camp in the tent. Day 04 Trek to Yalbang Khola O/N camp in the tent. Day 05 Trek to Thumkot Khola O/N camp in the tent. Day 06 Trek to Yari O/N camp in the tent. Day 07 Trek to Hilsa over the Nara La Pass 4550M. O/N camp in the tent. Day 08 Trek to Sher. Meet Tibetan Guide & proceed to Taklakot O/N at Hotel. Day 11 Trek to Dira Phuk gomba. O/N camp in the tent. Day 17-18 Drive to Shigatse. Gang Gyen Orchard hotel (2 stars). In the morning visit Tashi Lhun po monastery and Old market of Shigatse. in the afternoon drive to Gyangtse and Visit Palchoe monastery, Kubum Pagoda stupa and old town of Gyangtse. O/N at Hotel. Day 22 Drive to Gongkar Airport and fly to Kathmandu. All necessary special permits for Nepal and Tibet. 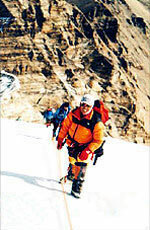 Full camping is organized in Nepal and Tibet with kitchen tent, guide, porters and in Tibet Yaks and Yak men. Accommodation in Nepalgunj before fly to Simikot. English speaking guide in Nepal side and Tibet. Tibet side transport by deluxe 4500 Land cruiser and support truck. Food 3 times a day prepared by our cook in Nepal and Tibet. Chinese visa (If not difficult you can obtain back home) If not we can organize here as well. Flight ticket Lhasa to Kathmandu. All the 3 meals up to Saga. Lunch and Dinner after Saga. Note: Any extra cost in the event of landslides and personal nature expenses such as evacuation or personal interest out of group's program need to be paid by clients themselves.